Donald Trump gets twice as much news coverage as the other candidates for president. Cable networks broadcast his rallies and news conferences end-to-end, he's mentioned nightly on late night comedy shows, and he even hosted "Saturday Night Live" in November. His rivals aren't the only ones asking: What happened to the equal time rule? "Every single media outlet covered his entire news conference on Tuesday night live and did not even mention the fact that Ted Cruz edged out John Kasich for second place in Michigan and won Idaho," complained one of his vanquished rivals, Carly Fiorina, on MSNBC on Thursday. Whether news outlets should cover Trump more than other candidates is an open question. But they are well within their rights to do so because the equal time rule — often mentioned and rarely understand — does not apply to news. "Obviously, the rule was originally written in a totally different information environment," Robert Thompson, the director of the Belier Center for Television & Popular Culture at Syracuse University's Newhouse School, told The Wrap. The rule dates to 1927, long before the era of round-the-clock cable news. And it didn't anticipate a candidate like Trump, who erases the already thin line between news and entertainment. Still, "the equal time rule does not apply to the news business, because journalists need to have latitude to cover the news as they see fit," Loyola Marymount University journalism professor Kate Pickert told TheWrap. "I don't think it's just that Donald Trump is a good spectacle. I actually do think his candidacy is incredibly newsworthy." The rule began with the Radio Act of 1927, when legislators were concerned that some broadcasters would try to manipulate elections. The Federal Communications Commission got involved in 1959, when fringe Chicago mayoral candidate Lar "America First" Daly demanded free air time in response to coverage of incumbent Richard Daley. Since the 1970s, debates have also been considered on-the-spot news events, and therefore exempt from the equal time law. Which is why moderators got away with asking Trump so many questions while poor Ben Carson — who has now endorsed Trump — wait silently to speak. Pickett, a former Time magazine writer, says networks are just covering the news when they cover Trump. She defended CNN's decision, for example, to air Trump's full news conference on Tuesday night despite Hillary Clinton speaking at the same time. "Newsworthiness is a judgment call. Politicians, on primary night, tend to basically give a version of their stump speech. It's not clear to me that those are more substantive than a Donald Trump news conference," Pickert said. Many viewers have accused the news media of focusing on Trump because he's entertaining, trying to gain viewers or clicks. "If you've got your front-running candidate giving an hour-long press conference, certainly, to some extent you're letting him use you as his mouthpiece, but that is completely newsworthy," Thompson said. "To cover that, though, and not cover similar things would be certainly unethical." In the past, Congress has said both daytime talk shows and "Entertainment Tonight" are legitimate newscasts, protected by the equal time exemptions. That creates yet more opportunities for media-savvy, entertaining candidates. Politics and entertainment have always been intertwined. Presidential candidates in the 1800s were the subjects of catchy pop songs. And Ronald Reagan was an actor before he was a governor or president. But Trump, a former "Apprentice" host, goes further — and gets coverage from all corners as a result. Interestingly, political shows don't have to provide equal time when they favor politicians who are also entertainers — but entertainment shows do have to provide equal time when they favor entertainers who are also politicians. Case in point: When Trump hosted NBC's "Saturday Night Live" on Nov. 7, he received 12 minutes of airtime. Because "SNL" Is not a news show, GOP contenders John Kasich, Mike Huckabee, James Gilmore and Lindsey Graham filed "equal time" requests with the network. NBC gave 12 minutes of free airtime to each campaign during prime-time hours on Nov. 27 and Nov. 28, as well as during "SNL" on Nov. 28. The time was be granted across 18 affiliate stations that broadcast in all or part of three early-voting states, according to Adweek. The decision didn't cost NBC much in ad dollars, Adweek points out: NBC's schedule those nights included reruns of the National Dog Show and "Saturday Night Live" on the two nights following Thanksgiving, which are among the least-viewed TV of the year. MSNBC's "Morning Joe" is among the news outlets that have been accused of being too cozy with Trump. But co-host Mika Brzezinski said Trump has just been more accessible than his rivals — "like it or not." "But don't blame us if the other candidates are not as accessible," she said. Host Joe Scarborough offered an open invitation to other presidential hopefuls: "Any candidate that wants to pick up the phone and call us, we'd love to have you on." Trump has proven he is anything but afraid of the phone with regular calls to morning shows. "Fox News Sunday" Chris Wallace recently criticized other Sunday shows for allowing Trump to call in instead of speaking with interviewers face-to-face. How much has Trump dominated media coverage? You can probably answer that one yourself. But studies bear out what's obvious to viewers. Trump's campaign was the second most-popular broadcast news story of 2015, after winter weather, according to the Tyndall Report, which monitors evening news broadcasts on ABC, CBS and NBC. Trump was featured 327 times on the three networks. His former "Apprentice" employer NBC led with 122 stories, followed by ABC with 121 and CBS with 84. No other GOP candidates cracked the list of the Top 20 stories. The NFL's "deflategate" scandal earned more mentions than Ted Cruz or Marco Rubio. Hillary Clinton's campaign was the 17th biggest story, earning 121 stories — 206 fewer than Trump. The situation is similar on cable. From June 16, the day Trump announced he was running, through Sept. 14, Trump was the subject of at least 2,159 CNN reports, according to the Wall Street Journal. 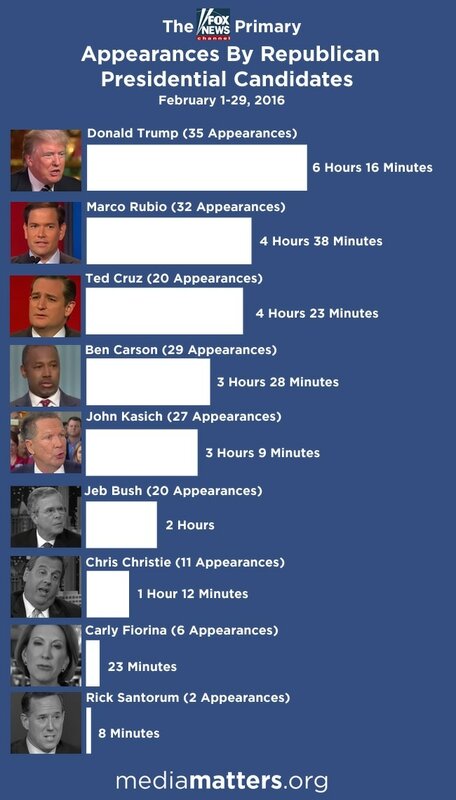 That is nearly double the amount of time CNN spent on then-frontrunner Jeb Bush in the same period. And according to Media Matters, Trump held a "commanding lead" in interview airtime on Fox News in February. "Trump's 6-plus hours of interview airtime is the most airtime any candidate has received in any month since Media Matters started tracking appearances in May 2015," said the non-profit group. Don't expect the Trump barrage to end anytime soon. He's handed off the "Apprentice" hosting duties, which means rivals can't demand equal time from NBC. Trump's "Apprentice" replacement, interestingly, is Arnold Schwarzenegger, who also made good use of equal-time exemptions: He received plenty of free media coverage as a candidate for California governor. And pushed us further into a world where politicians and celebrities are one and the same.